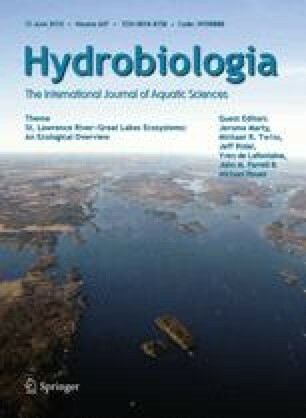 We examined factors and pathways involved in the transfer of mercury (Hg) to the food web in St. Lawrence River embayments near Cornwall, Ontario, where natural remediation of contaminated sediments (eventual burial by settling of cleaner sediments) has been adopted as a management strategy. Yellow perch (Perca flavescens) from one of the study zones (Zone 1) along the river by Cornwall contained significantly higher total mercury (THg) concentrations than perch from other equally contaminated zones. While THg concentrations in benthic invertebrates did not vary among contaminated zones, THg concentrations in yellow perch and invertebrate prey recovered from the perch stomachs were 1.5–2.5 times higher in Zone 1 than those from other zones, suggesting that prey selection affects THg accumulation more than habitat location. No significant differences were found in THg concentrations among different prey species within Zone 1, although there were significant differences in THg concentrations in the same prey species within Zone 1. In contrast, THg concentrations among different prey species increased significantly with trophic level in other contaminated and reference zones. The lack of correspondence between trophic position and THg accumulation in Zone 1 suggests two possibilities: (1) yellow perch in Zone 1 are highly mobile and are assimilating THg from a wide range of prey across Zone 1 with variable THg concentrations and (2) there may be an important non-dietary source of THg to the Zone 1 food web. Potential waterborne Hg sources to Zone 1 were investigated. Whereas THg and MeHg values in discharges from a disused canal were similar to Zone 1 surface water values (0.97 and 0.04 ng l−1, respectively), concentrations in storm sewer and combined sewer overflows discharging in the vicinity of Zone 1 were 19–45-fold (THg) and 2–4-fold (MeHg) higher than upstream river water. Contributions of Hg to the water column from sediment–water diffusion, estimated using a simple, well-mixed reactor model, ranged 0.05–0.1% of the surface water THg concentration and 1–2% of the MeHg concentration measured in summer months in Zone 1. Although not investigated in the other zones, a strong correlation (r 2 = 0.82) was found between MeHg in porewater and amphipod concentrations in Zone 1, indicating that the sediment porewater is bioavailable and likely an important pathway for transfer of sediment Hg to the foodweb. Large areas of Zone 1 contain bark deposits and produce high rates of gas ebullition, and may not provide favourable conditions for progressive burial with clean sediments and attenuation of Hg transfer to biota through natural remediation. Careful monitoring of surface sediment concentrations and biota is required in these areas. Failure to reduce concentrations of Hg in these media would indicate alternative or additional management measures are required. We thank Conrad de Barros (Ontario Ministry of the Environment) for providing stormwater and canal data and for on-going discussions during the course of this research. We gratefully acknowledge the participation and support of Laurier Poissant (Environment Canada) in the research program. Valuable assistance has been provided from technical staff and many summer students from Queen’s University, Ottawa University and the St. Lawrence River Institute of Environmental Sciences. We acknowledge the efforts of Bruce Doran (St. Lawrence River Institute) who led the zooplankton sampling and enumeration efforts. Funding for this research was provided primarily through NSERC Strategic, NSERC Discovery and the OMOE Best in Science granting programs.